FC Halifax Town were knocked out of the FA Trophy after Solihull Moors beat them 1-0 in their second round replay. Nathan Blissett scored again against The Shaymen for the second game running to decide the tie. Halifax produced a stirring comeback on Saturday to earn a 2-2 draw, but couldn’t produce another fightback here, and were left to reflect on not making the most of some incisive breaks forward, and were again left to rue that crucial bit of quality in the final third to cap off a good overall display. Town were the better side in the first 45, with the visitors aggressive in the tackle and looking hungry, with Solihull too pedestrian at times, misplacing too many passes and crossing wastefully. As on Saturday, Town’s decision-making in the final third let them down. After Scott Quigley had a low shot saved by Ryan Boot early on, The Shaymen got into a great position on the edge of the Solihull box, but the pass through to Matty Kosylo, which would have put him through on goal, saw the winger caught offside, and the chance went. Apart from a Jamey Osborne shot that was deflected wide, the hosts had made no real impression on Town, who were nearly the architects of their own downfall when Jacob Hanson miscued a clearance from close range, but Sam Johnson reacted brilliantly to keep it out. Moments later, a long throw was headed into the path of an onrushing Solihull man, who prodded the ball over on the stretch at the far post. Quigley, Southwell and Solihull skipper Kyle Storer all had decent shots from range, but it was on the counter-attack where Halifax looked most dangerous. And they should have converted a quick break into a goal a few minutes before half-time when they bore down on the Solihull goal with three-on-one, but Southwell unforgivably overhit his pass with a team-mate to either side in space. Kosylo had a low shot kept out by the legs of keeper Boot shortly before the break signalled the end of an encouraging opening half for The Shaymen. The game was still to really come to life when Cameron King, one of four changes for Halifax, found Quigley in a yard of space a few minutes after the restart, but the Town loanee fired over from 20 yards. Neither side offered enough composure in key areas to carve out clear chances, with the first goal looking increasingly likely to be decisive. And it came from Solihull just before the hour when Osborne’s terrific shot from an angle crashed off the bar, and fell perfectly for Blissett to turn in on the rebound. 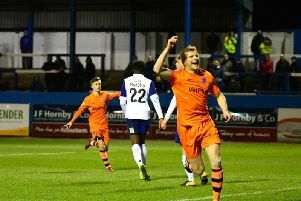 Quigley then spurned a glorious chance to level when he was superbly played through by Kosylo, but the striker sent his low shot across goal and wide. Solihull had attacked with more purpose and fluidity since the interval, and defender Alex Gudger could have added a second for Moors but headed wide unmarked from eight yards. Again Town got into a promising position with a quick break forward, but substitute James Berrett left it a little too long with the final pass, and the opportunity was snuffed out. Solihull were happy to protect their lead as full-time edged nearer, and Town struggled to muster the same kind of rousing finish they had three days earlier. Solihull: Boot, Williams, Gudger, Daly, Reckord, Storer, Osborne, Maxwell, Blissett (Stenson 76), Hylton (Hawkridge 59), Wright (Yussuf 85). Subs not used: Carline, Flowers. Halifax: Johnson, Hanson, Clarke, Brown, Sellers, Ferry, Maher, Kosylo, King (Preston 64), Southwell (Berrett 64), Quigley (Edwards 76). Subs not used: Rowley, Staunton.